Business is trying to resurrect Asia’s economic miracle a year and a half after the Tohoku tragedy. Tokyo is enjoying a long-deserved renaissance. Young professionals are converging from all across the Japanese archipelago, driving the population of the Japan’s capital up by about 1 million people, to about 12.5 million, since 1995, while the nation’s population has leveled off at about 128 million since 2004. Cranes are swinging over gaping construction sites citywide thanks to relaxed building height restrictions, defying occasional tremors and transforming the city into a showcase for displays of cutting-edge 21st century architecture. Opened in May was the 634-meter (2,080-foot) Tokyo Skytree, the tallest tower in the world. Europe teeters at the edge of an economic abyss, its fate in the hands of political leaders at odds over how to solve the continent’s twin debt and bank crises. America may be pushed over a “fiscal cliff” at the end of the year by political dysfunction. And even China, although unlikely to take a deep dive, is hostage to the will and ability of its government to stimulate growth. More than at any point in recent history, the global economy’s fate is tied to the capriciousness of policymakers. 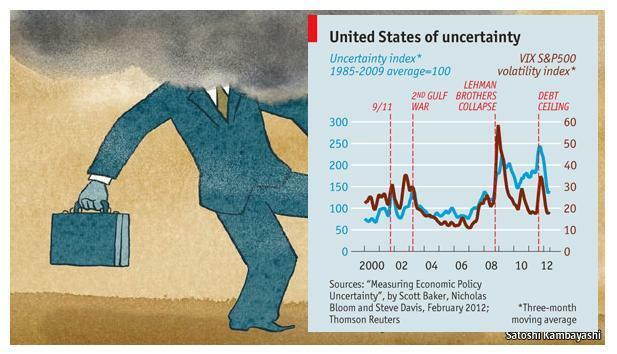 How much does such uncertainty cost?